Signing her lease at Piquette Square, Melissa Hill-Pearson felt it also marked a new lease on life. Melissa is an American veteran who lost her way but never lost sight of her American dream. As she entered her Piquette Square apartment for the first time, Melissa hurried excitingly from room to room in her new one-bedroom unit. “This is so nice,” she said repeatedly and breathlessly. 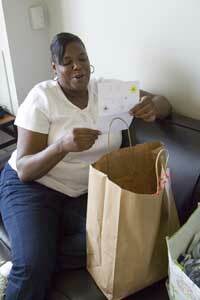 Melissa was among the first set of veterans to move into Piquette Square on June 6. Piquette provides long-term supportive housing for homeless veterans to enable them to reintegrate into the community. The 150-unit facility is located near the New Center area. Southwest Solutions developed the $23 million project and owns and manages it. John Van Camp, president of Southwest Solutions, was on hand as the first 40 tenants arrived at Piquette. After surveying her new apartment, Melissa sat on her living room sofa and opened a gift bag of toiletries. Inside the bag was a note handwritten by a local Girl Scout. Melissa smiled and said, “I was once a Girl Scout myself.” The note will become a memento. The apartments at Piquette are furnished, but kitchen, bedroom and bathroom items were needed for each unit. To acquire these items, groups, organizations and businesses organized “showers” or festive donation events. Funds raised were used to purchase room items on the Piquette Wish List.